Didn't try the recipe's recommendation to rinse and dry sliced shallots, but could try next time. Delicious anyway. Cut hanger steak in uniform thickness pieces, and adjust cooking time as needed - plus or minus a minute or two - for each cut. This has become my standard way of making mashed potatoes. It's delicious and I always am asked for the recipe. I have to say I don't usually make the braised celery part of this recipe, just the puree. Also, the milk-water cooking liquid makes an outstanding base for a fish chowder. The polenta was good. The lobster was ok.
Can substitute prepared/canned canellini beans or pinto beans for the cranberry beans. This cookbook offers recipes from the menu at Cafe Boulud that center around four themes: the classic dishes of French cooking (La Tradition), the seasonal specialties of the market (La Saison), dishes from cultures near and far (Le Voyage), and vegetarian dishes that celebrate the garden's harvest (Le Potager). 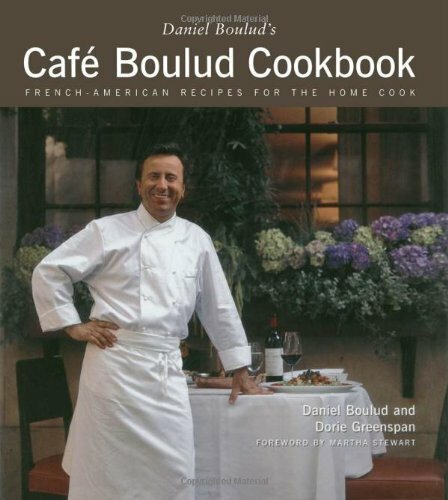 The more than 200 recipes included here, translated by leading food writer Dorie Greenspan, convey the trademark sophistication and style of Boulud's meals in a friendly and approachable manner.